A great swag for any season. 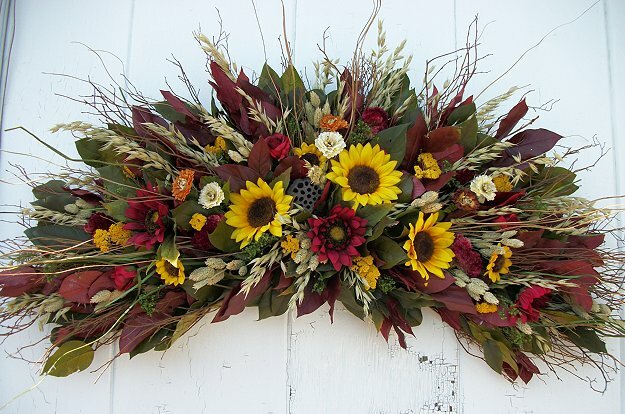 Golden yellow and burgundy silk sunflowers, autumn colored mixed flowers, lotus pods, and natural grasses, are gathered on a bed of twigs and preserved salal leaves Swag shown is 36". Thank you so much for the wreath - it is so beautiful!!! I love looking at it - My sister wants one too. So she will contact you thru e-mail. i will be interested in a swag soon - approx 36 inches -- but i'm not sure what design. I'm sure I will contact you soon. Thank you again..
Rosemary ... Kings Park, NY.